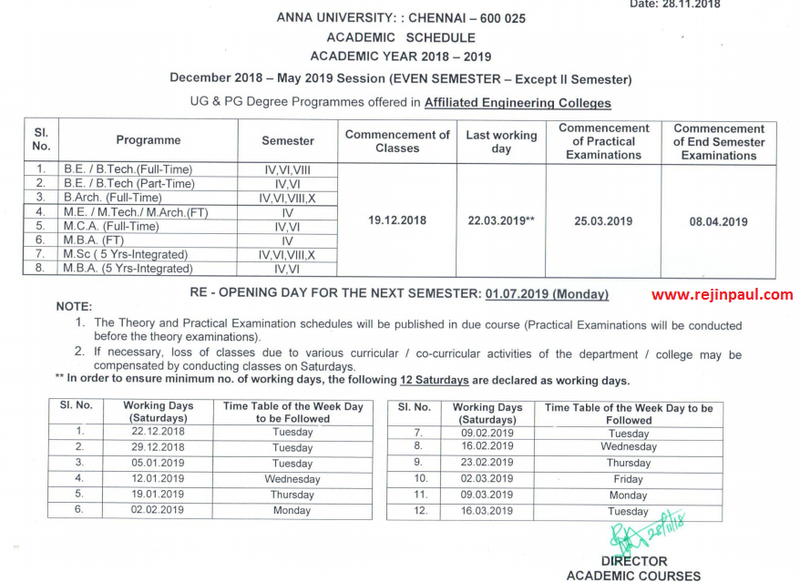 Anna University Even Semester academic Schedule for the academic year 2018 -19 has been Announced By Anna University Chennai, This Schdeule will be common to all colleges under Anna University Chennai. Students From Various Anna University Affiliated Colleges have completed their Nov/Dec 2018 semester exams & students are enjoying their vacation holidays as well. Now, Students Should be aware of Colleges reopening date for the upcoming semester which has been announced by Anna University Chennai as below. First year, Second Year Students, Third Year Students have completed their Nov/Dec 2018 Semester Examinations In the month of Jan 1st week and Now Waiting For Nov Dec 2018 results. Note : Your College May Fix Different Reopening Date, Which May not Suit Anna University official Date, Kindly verify With Your College staff to know exact Reopening Date.